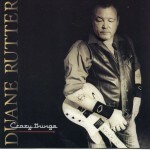 With his suitably rough-hewn baritone pipes and a first-rate production heavy on the pedal steel, Ontario-born Duane Rutter completes a hat trick relating time-honored country story lines with remarkably fresh lyrical takes. The killer chorus of “Who Found Who”, with JB Reed’s additional vocals and laced with organ courtesy of The Band’s Garth Hudson, should garner this track worthy attention. Standing out as well is the smoldering ballad that serves as the title track and a classic outlaw lament “Don’t Forget”.